When it comes to condiment fandom, there are people who enjoy ranch dressing, and then there are people whose desire to douse ranch on everything they consume borders on the bizarre. 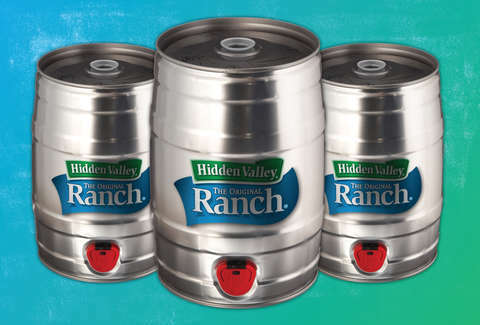 For those of you who fall into the latter camp, we have some good news: Hidden Valley is now selling ranch mini kegs, which'll dispense up to five liters of creamy, goopy deliciousness at the press of a button. The keg, which can hold over 20 standard 8oz bottles worth of dressing, features an easy-pour spout and sports a large Hidden Valley logo, so your ranch fiend friends will know exactly where to huddle for the duration of your next party. It's also apparently stackable, should you somehow feel the need to keep a backup handy. They're priced at a cool $50 apiece, and come with a year's supply of Hidden Valley Ranch included -- though considering the wide range of intake habits, it's tough to gauge exactly how much ranch that is. The king-sized dressing vessel is just one of many items in Hidden Valley's new holiday popup e-shop, which is stocked with lots of other ranch-themed merch and festive gifts including t-shirts, tree ornaments, tote bags, hats, and even the special ranch fountain the brand debuted earlier this year. Gotta hand it to good ol' ranch-obsessed American ingenuity.